Patreon has significant accessibility issues. People with a variety of impairments will have difficulty using it, at best. Some people are simply unable to access the platform, either to support projects, or create projects themselves. Over the last 10 months I’ve offered my assistance to help with accessibility and advocated for it. Then, I noticed a tweet from Patreon about “Hang Time” with their CEO. But it’s on a platform that isn’t accessible! I am reminded of the story of a petition on the White House “We the People” site. The petition was in support of a copyright treaty allowing media shifting. This would have allowed people with sight impairments to access digital books through assistive technology. But the petition site wasn’t accessible to people with sight impairments! And in order to lodge a complaint, you had to complete a CAPTCHA, which was not accessible either. So, the petition to help blind folks access material was not accessible, and there was no way for blind people to complain about it. I chose Patreon for my A11y Rules Podcast, a podcast about web accessibility. I chose that platform, despite the fact that it isn’t accessible because there isn’t, as far as I know, an equivalent system. That said, the show is available on other platforms than Patreon, which should be accessible. Before creating a project for my podcast, I reached out to Patreon. There is no contact information that I could find on the site. The About page lacks that info. The footer has “Help and FAQ”, but there is no contact information. Using the search function yields no usable results. 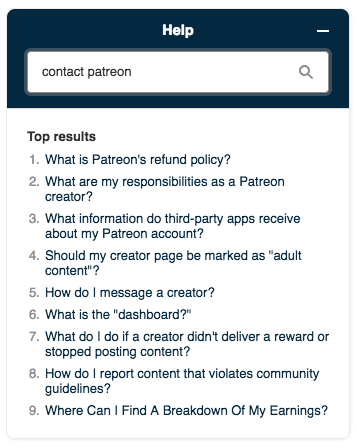 Clicking the help button loads a search box but when you search for “contact patreon”, none of the top 9 results point to contact information. So I went in search of Patreon staff on LinkedIn. I found several people. I contacted a handful, and even got a response from Adam Fishman, VP of Growth & Platform at Patreon. On July 6, 2017, Mr. Fishman gave me the name of one of his staff that had, apparently, done a lot of research about accessibility. Mr. Fishman stated that Patreon cares about building inclusive products, and they understand accessibility is an important part of that. But that “to set expectations”, he needed to point out that “there are many important things that we are triaging regularly”. That should have been a red flag right there. I have emailed Mr. Fishman’s staff every few weeks since July last year, offering my assistance and seeking updates. The last response I received was mid-February. Telling me that accessibility is on their list and consciousness but they can’t say when they’ll work on it. In the meantime, I regularly tweeted about Patreon lack of accessibility and tried to get a response from their CEO, Jack Conte. I never heard back from Mr. Conte. Every month, Patreon offers an opportunity to spend time with the CEO, Jack Conte. I only just became aware of it through a tweet. Every month, we go live for an hour to answer your questions and give updates on what we've been building for you. I immediately signed up for this meeting. I was pleasantly surprised that there was already a question from someone else about accessibility. Of course, I upvoted it. Then I had a closer look at the platform Patreon uses for this meeting. They use crowdcast.io. I did not conduct an accessibility audit on the site. I merely ran aXe and WebAIM’s WAVE on the site. aXe returns 63 violations of WCAG AA (several requiring review). WAVE gives 20 errors and 17 alerts. These numbers are enough to indicate that an assistive technology user would struggle to use the platform, at best. The people who would most benefit from Patreon becoming accessible are locked out of the conversation because the system used isn’t accessible. I won’t ascribe to malice which is likely ignorance. But as a disability rights advocate, as a creator missing out on patronage, and as a friend of creators with disabilities who want to be able to use Patreon, I’ll admit to a high level of frustration. It’s time for a change. I hope that Mr. Conte and his staff pay attention. I renew my offer to help them on the way to a more accessible platform – but I’d be happy for them to work with any other expert in the field of web accessibility. Just as long as there’s movement in the right direction. It would be great if Patreon came to accessibility willingly rather than appearing to ignore the need and drag their feet.